Are you emotionally blocked? Repeating the same patterns? Suffering from illness and pain that nobody can explain? Or just want to love yourself more and have more self confidence? A transformational spiritual healer can help you find the meaning behind your challenges. What to expect from a one on one session with Kasey. 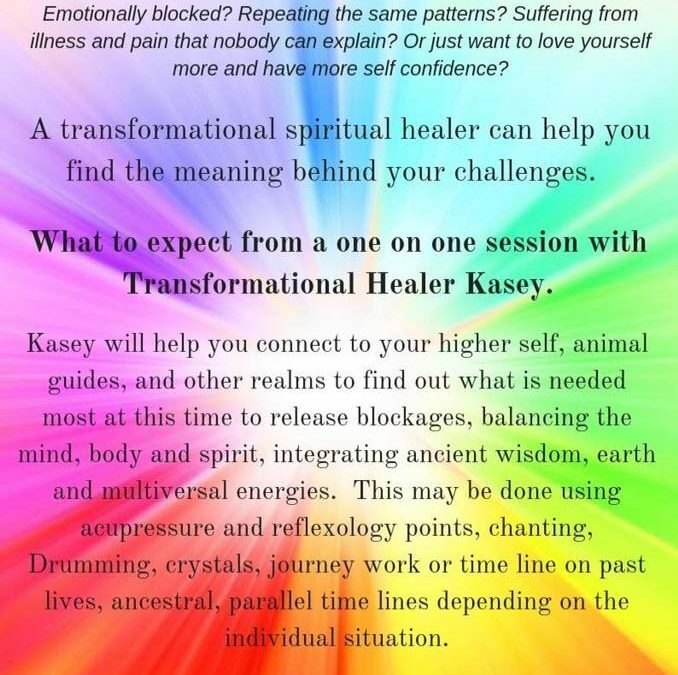 Kasey will help you connect to your higher self, animal guides, and other realms to find out what is needed most at this time to release blockages, balancing the mind, body and spirit, integrating ancient wisdom, earth and multiversal energies. This may be done using acupressure and reflexology points, chanting, drumming, crystals, journey work or time line on past lives, ancestral, parallel time lines depending on the individual situation. Call Kasey on 0447 483 461 for bookings.